Potanin has shot up the rankings from last year, being one of the few miners to come out ahead despite the downturn. Last year he was ranked 86th globally, and only at number 7 in regards to mining. He is now also the richest person in Russia. Usmanov has been unseated from his top position last year after recording a 22 per cent drop in his wealth year on year. He also slipped significantly in global rankings, after coming in 40th last year. This also means he is now no longer the richest person in Russia, slipping to third. Usmanov, like many Russian and former Soviet oligarchs, built his fortune in mining operations. He runs USM, holding 100% voting rights in the company, and is the co-owner of Metalloinvest, which owns metal and mining businesses such as Lebedinksy GOK and Ural steel mills. Usmanov also holds a large stake in underwater mining company Nautilus Minerals, which holds exploration tenements off Papua New Guinea. Velasco has recorded the third consecutive drop in his revenues year on year, although his wealth stating relatively stable compared to the rest of the sector, which contributed to his rising in the rankings from 6th to third for mining, although he did fall from 67th to 77th globally. German Lerrea Mota-Velasco is the head of Grupo Mexico, the largest mining corporation in Mexico and the third largest copper producer in the world. In a similar fashion to Velasco, a relatively small drop in wealth has seen Fontbana retreat down the global list from 58th last year, but actually ascend the mining list from 5th position in 2014. Iris Fontbona is the widow of Antonio Luksic, who is the founder of the Luksic Group. Similar to GroupoBAL, Luksic holds a number of interests in different areas, but predominantly in mining. The group has major holdings in Antofagasta, the UK listed copper miner. The only Indian on the list, Mittal’s fortunes have been hit particularly hard, with his wealth more than halving in the last four years. Mittal came in third for mining, and 52nd globally last year. Mittal is the chairman and CEO of ArcelorMittal, the largest steel manufacturer in the world. He opened his first steel mill in Indonesia at the age of 26 and has gone from strength to relative strength since. Coming off a high of $31.1 billion in 2011, Mittal has seen his fortunes dwindle as the demand for steel shrinks. Mordashov is another Russian who has fared well over the last year in spite of the spiralling rouble. Last year he snuck into the list in 10th place, and sat at 111th, globally. Like a number of Russian and East European billionaires, Mordashov made his money during the break-up of the Soviet Union. Whilst working for Cherepovetsky Metallurgical Plant he bought a major stake in the factory when it was privatised. He later became a general director of the business and went to build the conglomerate Severstal, acquiring coal and mining companies. His wealth grew in spite of the selling off his North American steel plants to the Renco Group for $1.2 billion, less than half of what he paid for them only three years ago. The only Australian on this list, Rinehart’s fortunes have slipped significantly, by close to a third, in the wake of the tumbling iron ore price. Last year she came in second for mining, and 46th globally. Despite this she is still Australia’s richest person. While many believe Gina inherited much of her wealth from her father’s company and operations through Hancock Prospecting, when she assumed the chair of HPPL the company was actually found to be in serious debt. According to the company “much of Rinehart’s wealth has been generated since her executive chairmanship commenced in 1992″. This was done through the development of the Hope Downs iron ore project, the acquisition and development of the Roy Hill project, and its Queensland coal interests,” which all took place under Mrs. Rinehart’s executive chairmanship,”Hancock Prospecting said. The company owns swathes of extremely prospective iron ore tenements throughout the Pilbara, which is now being transformed into the massive Roy Hill mine. Rinehart also shares in the profits generated by the Hope Downs mine, and also has major stakes in the Alpha Coal and Kevin’s Corner coal project in the Galilee Basin. A heavily dramatised version of her life recently appeared on T.V., of which we will say no more. Lisin has dropped down the rankings dramatically, falling from fourth in mining, and 53rd globally, last year. A Russian steel tycoon, Lisin a one of the world’s leading authorities on metallurgy, and holds a number of patents on metallurgical processes. In a similar vein to Australia’s own Nathan Tinkler, (although much more successful) Lisin started at the bottom, working as a mechanic at a Soviet coal mine, working his way through the ranks to become a deputy chief engineer. Thanks to tenacious trading, which gained him a large share of the nation’s steel and mining industry following Soviet collapse, eventually becoming the sole owner of Novolipetsk Steel in 22000. He has been a director of Norilsk Nickel since 2002. Demonstrating the fading fortunes of many mining magnates, while Gonzalez has remained stable at ninth position on the mining billionaires list, he has dropped significantly down the global list, falling from 90th last year. Gonzalez owns a holding company called GroupoBAL, which amongst other things runs Penoles, which is the world’s largest producer of refined silver and bismuth, as well as Latin America’s largest producer of lead and zinc. Wenyin is a newcomer to the mining top ten list, and the only Chinese citizen. He has charged up the global rankings, rising from 354th last year to his new position just outside of the top 100, demonstrating the significant newfound wealth in China. He is the chair of the Amer International Group. Which produce cable and copper products, and holds interests in a number of copper mines based in China’s Jiangxi Province. A mine located in Canada’s historic Yukon gold belt is on sale for more than 3,000 bitcoins, or $2 million at current prices —the very first offering of its kind on popular bitcoin-only online marketplace, BitPremier. According to the listing, the small, producing gold mine located in Dawson City has the potential to produce 3,000 to 4,000 ounces of gold per year, and the price tag includes $1 million worth of actual mining equipment, the rights to one mining property and the lease agreement to another mining lot. The unidentified current owner claims to earn $1m annually in sales and, in an effort to also attract novice bidders, it adds he is willing to stay on to manage the property for up to five years and so ensure the operation runs smoothly. “The company was founded in 1986, the President and CEO of the company has been in the mining sector for 35 years. A well respected, fully compliant and profitable company, any new buyer could recoup their initial investment in as little as two mining seasons,” the ad says. For serious buyers, full financial statements, tax returns, profit/loss, balance sheets are available for due diligence. In March, an Indonesian villa was sold for over $500,000 on the website — the most expensive acquisition through the platform and the single largest bitcoin purchase ever. If successful the sale of this gold mine would definitively beat that record. Before 2013, Bitcoin was on few people’s radars. Designed around 2007 by someone named Satoshi Nakamoto (it’s still unclear who this person actually is), the currency’s value measured in US dollars went from about 5 cents per bitcoin (BTC) to around $13 in late 2012. But the virtual currency hit the mainstream in 2013 and just a few months later was trading for more than $100 per BTC. It breached the $1,000 mark at its peak in November. Today it’s valued at around $600. Bitcoins are created with extremely powerful computers that run algorithms to ‘mine’ for bitcoins. Anyone with the right equipment and know-how can become a Bitcoin ‘miner’ but there’s a predetermined number of coins that can ever be created. The main appeal behind Bitcoin is that when you trade bitcoins you’re pseudonymous and you pay practically no fees. Most importantly, the system is safe – though this idea has been seriously challenged by the recent collapse of the currency’s largest trading platform, MtGOx. The currency is also free from central bank and government control, which is why some see it as a good store of wealth. Gina Rinehart made history today when she was officially tagged as the richest woman in the world by BRW after hooking two deals in iron ore and coal. These deals, which almost tripled her wealth in the last year to $29.17 billion, according to BRW Rich 200 list, takes her a step closer to fulfilling a lifelong family dream to have the family company Hancock Prospecting build and operate an iron ore facility in the Pilbara. The $18.87 billion increase in her wealth is equivalent to earning the average annual wage in under three minutes, or almost $600 a second. 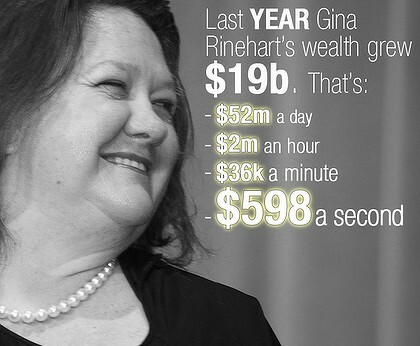 Mind boggling … Gina Rinehart’s golden year in numbers. [These figures have been rounded up]. SHOP HERE & get what you want for next to nothing. Another dream is to win two seats on the Fairfax Media board after becoming the largest single shareholder earlier this year. That dream was dealt a blow today when the Fairfax board announced a board creshuffle which didn’t include Gina Rinehart. The news of her estimated wealth will not go unnoticed by her three estranged children John, Bianca and Hope, who have taken legal action to remove her as trustee of the family trust. Based on the BRW valuation, the children’s shares in Hancock Prospecting are now worth over $9 billion. However, they cannot sell or leverage against them due to a clause in the company constitution that says they can only be onsold to lineal descendants of their late grandfather Lang Hancock. It also comes a day after settling a dispute with WA billionaire Stan Perron over the size of royalty payments he has been receiving from Hancock Prospecting and Wright Prospecting dating right back to 1992. The settlement came days before a trial of the case was due to commence in Western Australia’s Supreme Court. In a statement, Perron Group said the parties had agreed that Perron “is and has always been” entitled to a 15 per cent interest in the benefits and entitlements” because of that backing. The mining boom has turned BRW’s Rich List into a tailspin as traditional operators such as Westfield supremo Frank Lowy, the cardboard boxmaking Pratt family, retailer Solomon Lew, James Packer and Gerry Harvey have been usurped by mining entrepreneurs such as Andrew Forrest and Rinehart. It has also had major ramifications on the Australian economy, creating deep structural changes. According to BRW, if the resources boom continues, Rinehart’s wealth could increase to a whoping $100 billion, which would make her the richest person in the world – a situation that is unprecedented for any Australian individual. The BRW valuation is far higher than the valuation of Forbes, which estimated her wealth at $US18 billion in February. Part of the discrepancy between the two estimates is due to a further increase in iron ore prices over the past several months. But in the main it demonstrates that valuations of private companies are extremely subjective and based on a number of assumptions including debt. Rinehart’s $29.17 billion fortune catapults her to being the richest woman in the world, deposing Christy Walton ($26 billion) of the title, who is the widow of John Walton and has a major stake in US-retail giant Wal-Mart. Her wealth makes her the eighth richest person in the world, but still behind Mexican telco tycoon Carlos Slim, Bill Gates and Warren Buffett. Rinehart debuted on the Rich List in 1992 at $75 million after inheriting Hancock Prospecting from her father Lang Hancock after he died. In 2010 BRW estimated Gina’s wealth at $4.5 billion. By 2011 it was $10.3 billion. When she pulled off the Roy Hill deal with two South Korean companies and a Japanese company to sell 30 per cent of the iron ore tenement, providing her with $3.2 billion, it placed a price tag of $12.8 billion on a business that had previously been valued by BRW and Forbes at zero. An Australian site has developed an online wealth calculator that allows you to see how a mining magnate can make the equivalent to your annual salary in a matter of minutes. Australia’s ruler of iron ore, coal and the family trust. Chile’s copper widow and Mexico’s silver tycoon.